The cowgirl...she's strong willed and independent, she's as beautiful inside as she is outside. She'll never take no for an answer and when she's told she can't do it because she's a girl, she'll prove you wrong every time. She loves the thrill of the ride and the romance of adventure. She's you and she's me, but most of all, she just is. That's what this week's new releases are all about! First of all, Wendy Tunison Designs has created Cowgirl Chic. This was part of the DSD grab bag that Paula, Natasha & Wendy did last weekend. There are 74 Unique Ellies, 28 Unique Papers & an awesome Wood alpha in this kit and it's 50% off during it's introductory week! Take a peek at what our CT has created with this kit...they're pretty talented gals, that's for sure! Guess what? 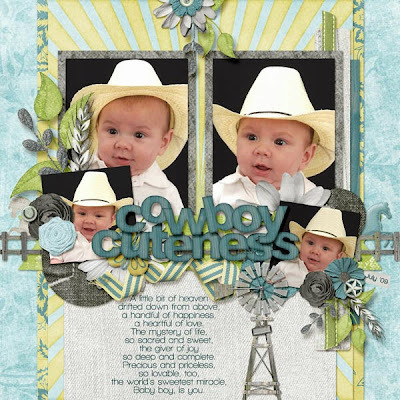 These colors are so versatile, that you can even create adorable cowBOY layouts too. Here's a close-up of mine. Perhaps your cowgirl is a little sweeter? How sweet is your little cowgirl? I think every little girl at some point dreams of being a cowgirl. We put on our mom's boots and dad's oversized cowboy hat and we are in that dream! This kit is all about celebrating that special little cowgirl in your life. This fun complimentary kit, Saddle Up Susie, has 52 Unique Ellies, 12 Unique Papers and 1 Cabachon Alpha! It's also 50% off through the 13th of November! Cowgirls, sassy? You bet! Add some fun to your layouts with this fantastic set of Cowgirl Lingo! Do you have more than one cowgirl in your life or just a lot of photos to scrap? How about a kickin' deal on the whole shebang? You got it! You can pick up the bundle that includes Cowgirl Chic, Saddle Up Susie and Cowgirl Lingo! Whoot! I've also got a cool new template set from Wendy Tunison Designs that I'm sure you're going to love! But be sure to pick it up today because it's only $1.00 on the 7th! After that, it goes back to full price! Available in Tiff, PSD, PNG, Page, SbPage & Craft Artist formats, she's got you covered! Temptations 24 is so much fun to play with! She's also got you covered if you scrap in 8.5x11! Check out the Small Stuff Vol. 24 version for the same $1.00 price tag on the 7th! I bet you can't wait to see what our CT did with these, right?! 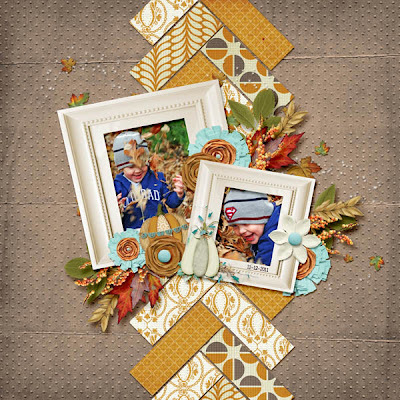 Did you notice that a lot of the layouts above were made with Autumn's Kiss? That's because Autumn's Kiss is 50% off this week too! Just in time to scrap all of the beauties of the season or that special Thanksgiving gathering! Here are a couple freebies for you too. Click images to download. Wendy has got a few challenges for you to come and participate in this month in case you need a little motivation to get some scrapping done. She's hosting the Collab Kit challenge at SNP this month. Come pick up this awesome store collab and create a layout with it to get, not only, 2 challenge points, but also a coupon towards next month's store collab! Are you looking for a fun new take on a photography challenge? Stop by and play along this month. Wendy has created a fun set of Photo Tags for you to enhance your photos for the challenge as well! She's also cooked up a freebie that you can pick up in the Use It All Challenge! Simply create a layout with all of the pieces of this kit for a point. You'll get an extra point for using pieces from the full size kit as well and to make that even easier, Wendy has got Tranquility on sale for 50% off all month long! Wendy is also hosting a challenge at Ginger Scraps this month! Did you pick up the daily download last month? 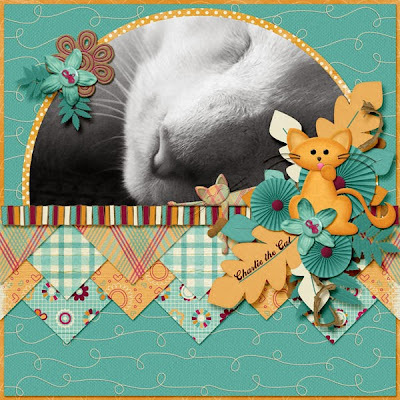 Then stop by this challenge and create a layout with it! Super simple! If you missed it during the daily download, she's got it on sale for 50% off right now as well! Whoot! Not enough challenges for you yet? Stop by Wendy's Facebook Fan Page and participate in her speed scraps this month. There are only two this month because after DSD she needs a little break and with Thanksgiving happening the last week of the month, I'm sure she'll be super busy with family. But in between, come on over and play along! Don't forget to stop by the store on Saturday to pick up these 3 kits for just $2.00 each!